All Star Boxing, INC concludes it’s Spring Season from Tampa, Florida with a welterweight showdown featuring WBO Intercontinental Champion and #12 ranked “Hurricane” Sammy Valentin (13-1-10 Kos) who will be defending his title against undefeated WBA FEDECENTRO Champion Roberto “Dinamita” Arriaza (15-0-12 KO’s) schedule for 10 rounds in the Main Event broadcasted Live on Telemundo this Friday March 16TH from the Bryan Glazer Center JCC. “Hurricane” Sammy Valentin bounced back last fall with a win over undefeated Mexican Alejandro Barbosa. Valentin previously lost his NABO title and undefeated record in the summer to Giovanny Santillan who is currently ranked #4 in the WBO. 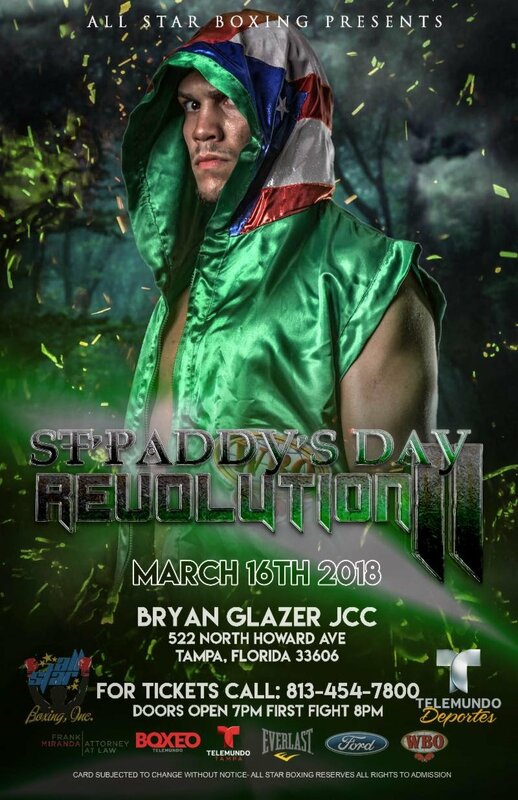 Roberto “Dinamita” Arriaza is currently coming off the longest layoff of his career, being inactive for over 9 months, is ready to make his Telemundo debut on Friday night. Arriaza has been training in Los Angeles, California for his upcoming bout and feels this is his time to shine. “Hurricane” Sammy Valentin Vs Roberto “Dinamita” Arriaza is bought to you by All Star Boxing, INC in association with Thompson Boxing.